I met Paul A. M. Dirac in 1962. When Paul A. M. Dirac visited the University of Maryland in October of 1962, I was a first-year assistant professor, and I had to provide convenience for him. At that time, I was confused. The Physical Review Letters was constantly sending out new words, such as Regge poles, N/D method, bootstrap dynamics, strip approximation, etc. However, to me, they did not sound like the physics I really wanted to do. I was fortunate enough to spend 30 minutes alone with Dirac. I asked him what I should do in physics. He said American physicists should spend more time to understand Lorentz covariance. This was a totally unexpected answer to me. 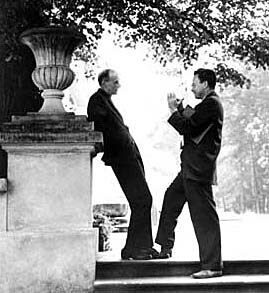 Dirac and Feynman in Poland while attending a relativity conference hosted by Leopold Infeld in July of 1962. 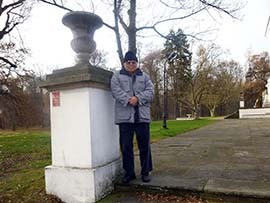 I was there in 2013. R. P. Feynman, M. Kislinger, and F. Ravndal, Phys. Rev. D 3, 2706 -2732 (1971). contains many new physical ideas, but it is a total mess from the mathematical point of view. 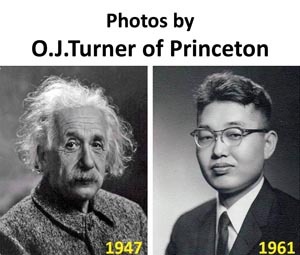 They could have done much better job if they had studied Wigner's papers on the Lorentz group. Only after I read Feynman's papers, I realized Dirac was talking about Feynman when he said "American physicists." Dirac and Feynman met in July of 1962 (three months before I met Dirac). They met in Poland. 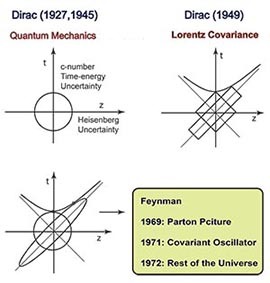 How about Dirac's papers? 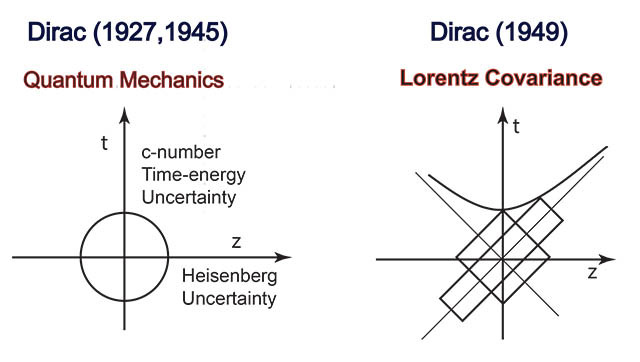 The best way to understand what Dirac told me in 1962 was to read Dirac's own papers. Dirac's papers all sound like poems, but they do not contain figures. The best way to understand his papers is to translate all those poems into cartoons. Here are thus my cartoons to tell you what Dirac told me and what I did. First of all, let us translate what Dirac told me into a cartoon. It is quite safe assume that Dirac made many attempts to place something into this empty space. Indeed, he did in the following papers. P. A. M. Dirac, Proc. Roy. Soc. (London) A114, 243 - 265 (1927). P. A. M. Dirac, Proc. Roy. Soc. (London) A183 , 284 -295 (1945). P. A. M. Dirac, Rev. Mod. Phys. 21, 392 - 399 (1949). His papers are like poems. It is possible to translate those poems into the following cartoons. Lornerz-covariant picture of bound states. Quarks and partons as one Lorentz-covariant entity. 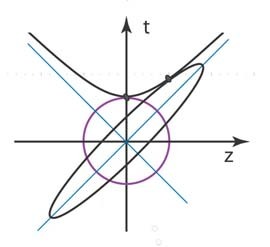 Coupled Oscillators as a model for the Lorentz-covariant world. Squeeze transformations in physics. Symplectic transformations. 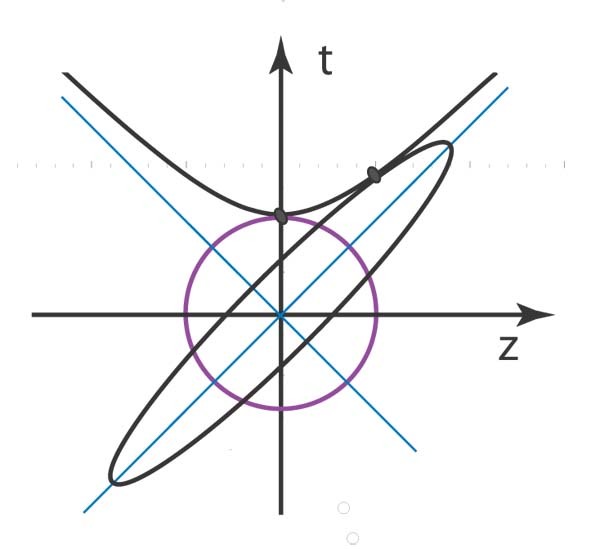 Role of entropy in the Lorentz-covariant world. Physics Letters A 147, 343 (1990). Entangled space and time variables. Jounal of Optics B: Qauntum and Semiclassical 7, s 459 - 467 (2005). copyright@2012 by Y. S. Kim, unless otherwise specified. Click here for Y. S. Kim's home page. The photo of Dirac and Feynman is from the Caltech Photo Archive. This photo was taken by Marek Holzman during the International Conference on Relativity Theory of Gravitation in Warsaw (Poland) on July 25-31 1962, organized by Leopold Infeld. The image of Jesus and Nicodemus is from "The Picture Bible" (David C. Cook Publishing Co., Elgin, Illinois, U.S.A., 1978).